If you want please join my face book page and post more photos. Here is a pic of mine. Currently running a 5 HP briggs and 2 speed set-up. Note that this frame did not come with the welded rod across the bars. Same multi color paint for now. I do have the Charger seat for it. Even though I think its a later version. Hey Joe thanks for sharing, it looks like to u have the model called a charger 3 as long as someone didn't just hack the cross bar off between the handle bars. I like how you have the optional 2 speed mounting plate I have yet to see that on a ccs even though I know that was an option that they offered. You think the seat is a later version?? Could you post a photo of the seat. And I have to ask. Is it for sale? Also do you believe that to be the original engine to the bike? It has the correct style fuel tank that I have seen on ccs survivors but the I thought they were only offered with a 3hp or 4hp motor. The trail boss model is the only model I know that was produced with a 5hp. If you believe it to be original, could you tell me the date of the engine. I added myself to your FB page. I really want one of these now lol. The engine on the bike did come with it. Don't know if it was the original or not. Here is the tag number HS40-55284B, Serial 0092 12787. 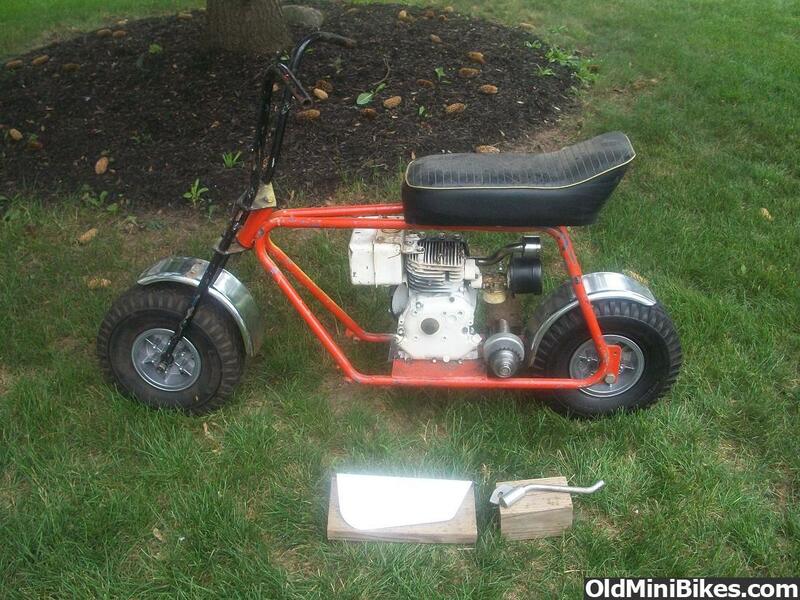 It is a mini bike motor. Has the original correct throttle assembly on it. Just don't know what year the Charger is. I'll post up later today a pic of the seat. Thought this might be of interest to you... Picked it up several years ago. Fork tube decal. Pretty sure it was a re-pop. I would say it's more than likely a 71 bike. I have a bunch of decals like that I recently got from bike buddy. Does $10 shipped sound fair? What type of ccs do you have u would love to see photo and ad them to my Facebook page dedicated to these bikes. Hello James, I sent you a reply 2 days ago but probably did not go through. Yes, the decals look good. Would like 3, what's the total $ and how do I pay you ? So its been over a year, but i have received an email back from Joe Debouver, and he is keeping his word and getting someone to help with scanning any in info on the ccs brand they may still have on file. Im super excited about this and can't wait to see what history he can dig up within the company. Thanks James. I have a paypal account but never used it in this manner. We’ll figure it out. You’re obviously quite knowledgeable on Charger minis. Would you have a look at mine. The tubes welded on he lower rear section of the frame don’t seem to be factory but do you think the rest looks right. I’m confident its a Charger Jr. but would like your input.